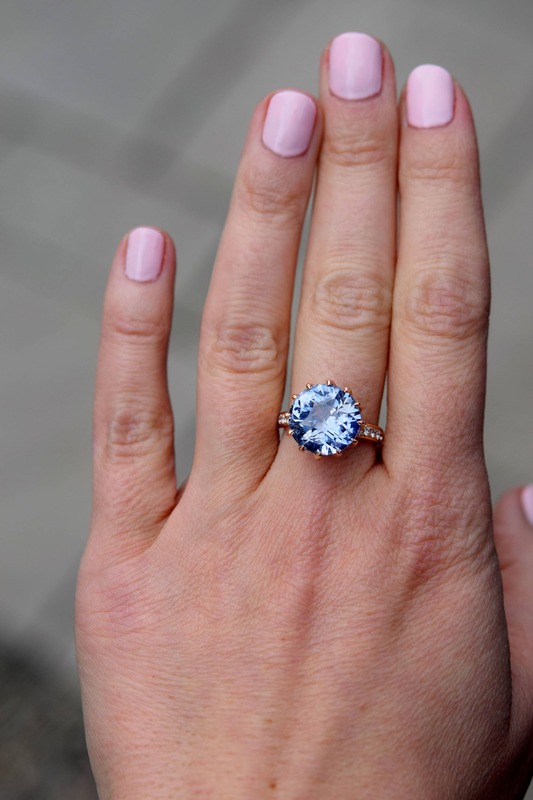 The sapphire in this engagement ring is really gorgeous! It is a natural non-treated beauty, 11.32ct, eye clean. Color is fantastic! It`s a mix of blue and grey with peach flashs. It is an awesome stone, unbelievably clean and sparkling! 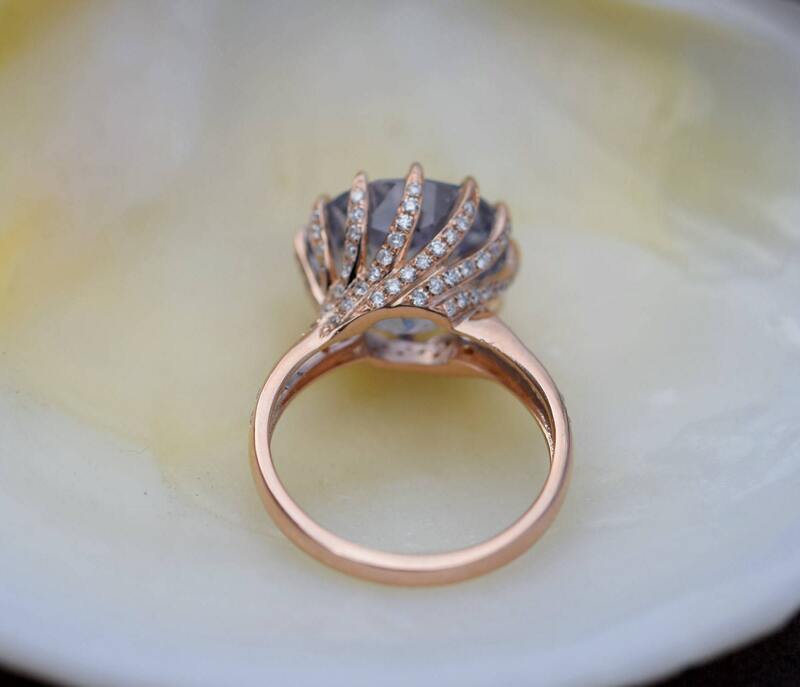 It is set in my signature Chrysanthemum setting, 18k rose gold, TDW approx. 0.5ct, SI/H, full cut. One of a kind ring! 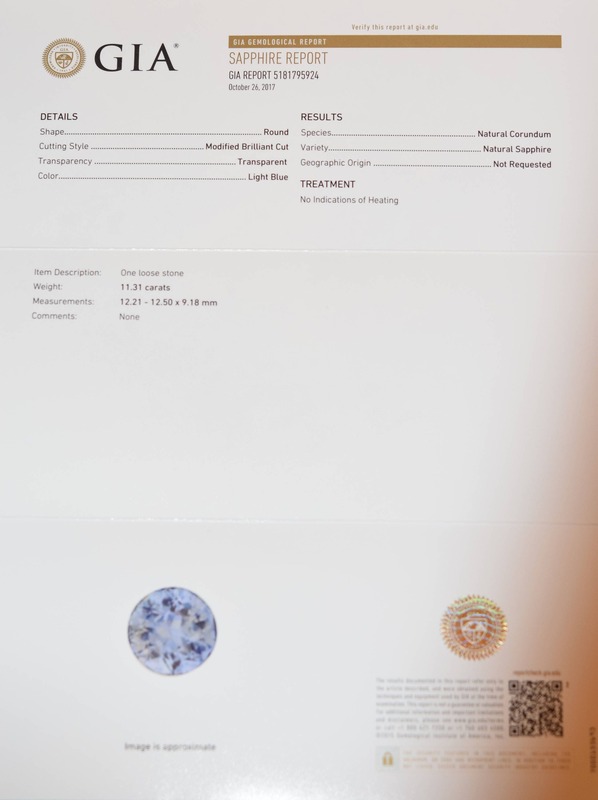 GIA identification certificate for the sapphire will be included with the purchase. If you would like to see the video of the ring - please let me know. 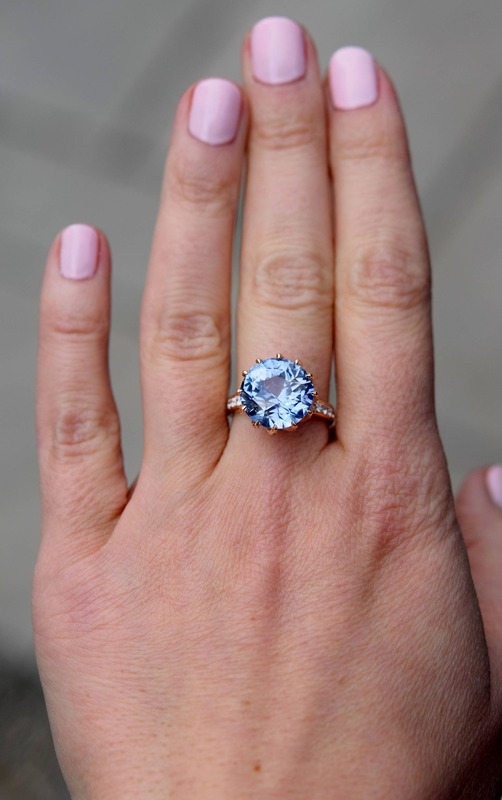 The ring is ready to ship in size 6, can be resized. Please contact me if you`d like to customize this ring with White Gold, Yellow Gold or Platinum or have it made with a different Center stone. If you like this ring, please press "Pin it" button on the right of your screen. Thanks! 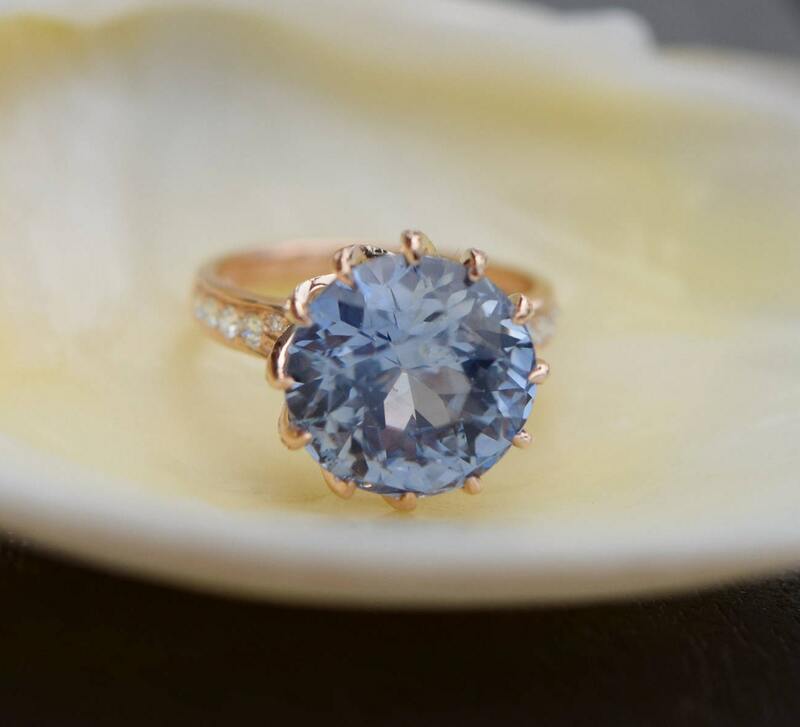 Although I do offer payment plans for some rings (excluding peach sapphire rings), I encourage buyers to use Paypal Credit rather than set up a payment plan with me. It is more advantageous since you get the ring right away and can use it for any ring listed in my shop (I would not even know you used Paypal credit). I do not offer financing. I put some rings on hold for up to 1 week. It depends on every individual ring. No deposit required. For custom orders - down payment would be required to start working on your piece. Canadian buyers are charged sales tax. For security reasons, I can only ship to PayPal verified addresses or CC billing addresses. 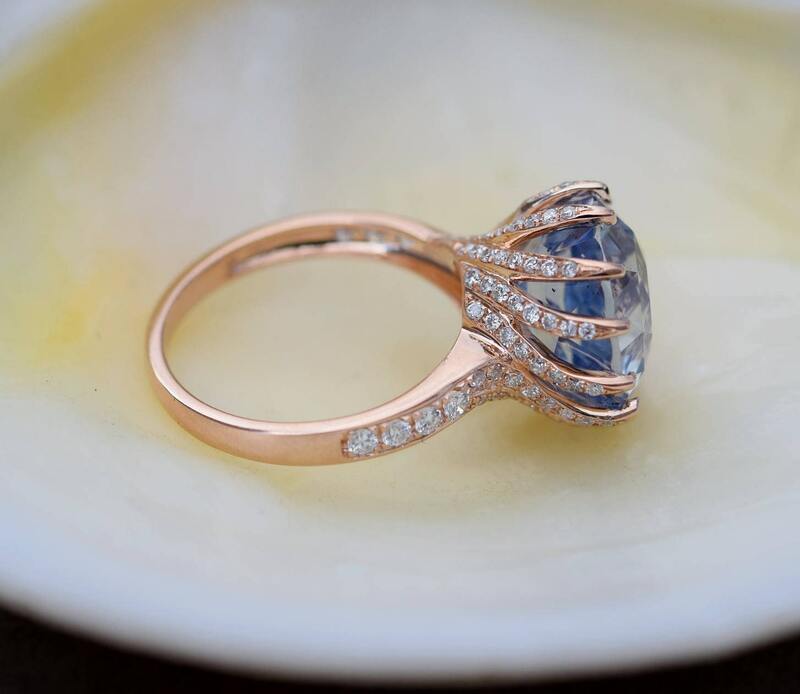 If you wish your ring to be shipped at a different address, please add it to your Paypal account before making transaction and indicate as your shipping address. My default shipping method is USPS Express Priority (insured and trackable, signature required on delivery), takes approx. 7 business days to the US. Usually no Taxes and duties apply. Cost is $50. UPS Express (insured and trackable), takes 24-48 hours. Signature is required, unless customer requested otherwise. Taxes and brokerage fees are charged. Shipping cost $90. The ring is shipped in a beautiful gift box, ready to present. Please note, for all international shipment, I MUST indicate the content for customs outside he package. I usually put "Gemstone ring, made in Canada". If you feel this statement could ruin the surprise you are preparing, please arrange shipment to an alternate address. If you are for ANY reason unsatisfied with your purchase, you can return it in original condition within 7 days for a 96% refund (4% Etsy fee is not refundable). In case any alterations were made by your request (change of size, etc), a 10% fee will be deducted from your refund. Please take into consideration, I do not offer returns for re-sizing. However, you may choose to pay a fix fee for resizing ($50) at the time you place an order. Then if you decide to return the ring, you`ll get the regular 96% refund, minus this $50 fee. Kindly note, CUSTOM ORDERS can only be returned for 96% refund if the jewelry is not as described or has any defects, within 7 days. Unfortunately, I can not accept return of CUSTOM ORDERS for any other reason. AFTER 7 DAYS NO RETURNS ACCEPTED (2-year repair/exchange in case of damage-please read my Warranty Statement below). ALL FEES ASSOCIATED WITH RETURNS, e.g. SHIPPING COST, TAXES, etc. ARE PAYABLE BY CUSTOMER. 1. 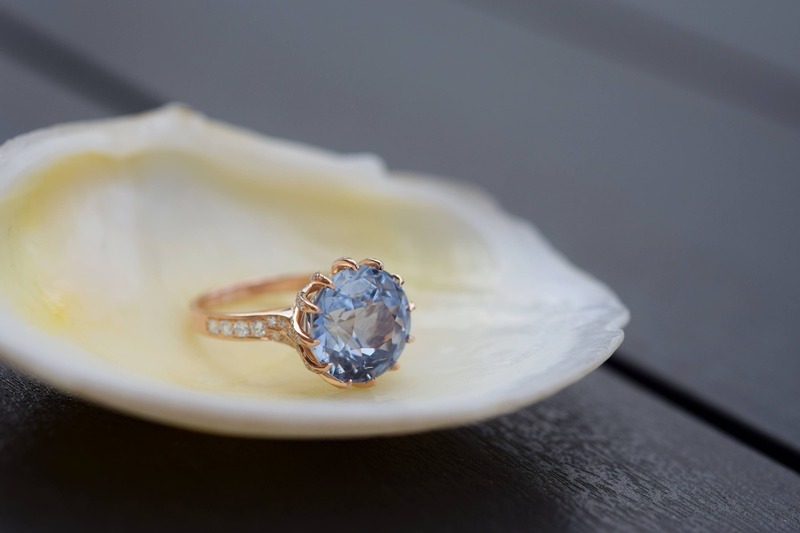 Insurance for jewellery is $500 max for any carrier (USPS, Fedex, UPS, etc). No matter what value is the ring, in case it gets lost you`ll only receive $500. 2. 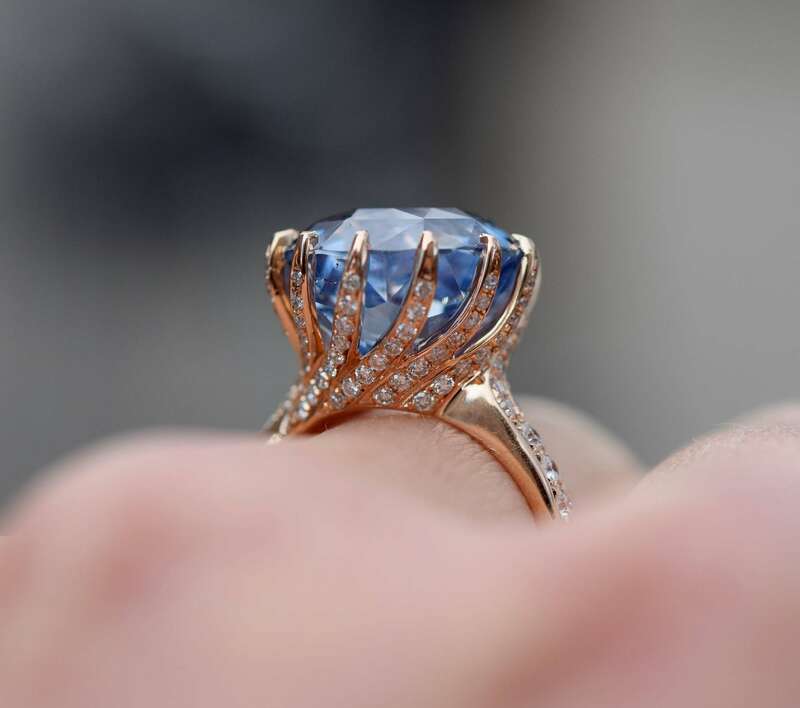 The ring valued $5000 is more likely to be stolen than the ring valued $100. 3. I pay 13% import tax. It would cost me a few hundred dollars to accept your return. In my 8 years selling on Etsy, I never had a package undelivered, if sent according to my instructions . I try my best to finish and/or ship your jewelry as soon as I can. My average turnaround time is 2-3 weeks. However, sophisticated custom orders may take longer. Please note, if you need any alterations - change of size, redesigning etc - it may take additional time. Contact me to check it out. For the Canadian customers: My studio is located in downtown Toronto, however due to the nature of my sales, my insurance company does not allow visitors in the studio. I offer 2-year warranty on my jewelery. If there is any issue (a small diamond fell off, etc) please convo me and I`ll provide the instructions how to send the ring back for repair. Or, as an alternative, I`d be happy to ship you a loose diamond to be re-set locally. In some cases, I would be able to replace/exchange the setting for you - please feel free to discuss it with me. Kindly note, the warranty does not apply to the loss or damage of the center stone. I do not offer free center stone replacement. Please examine your center stone carefully within 7-day return period. If you have not reported any issues with the center stone within 7 days I would not be able to offer lapidary services under 2-year warranty. 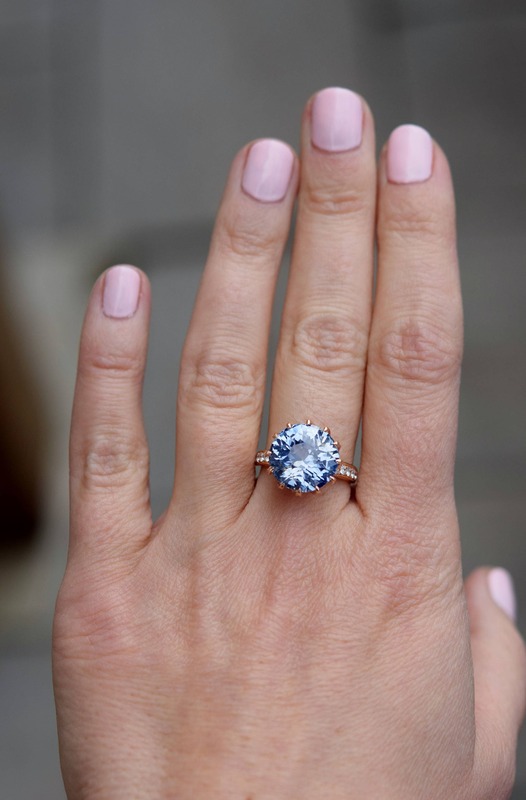 If any alterations other that re-setting of a small diamonds were made by your local jeweler, the return policy or 2-year warranty DOES NOT APPLY. 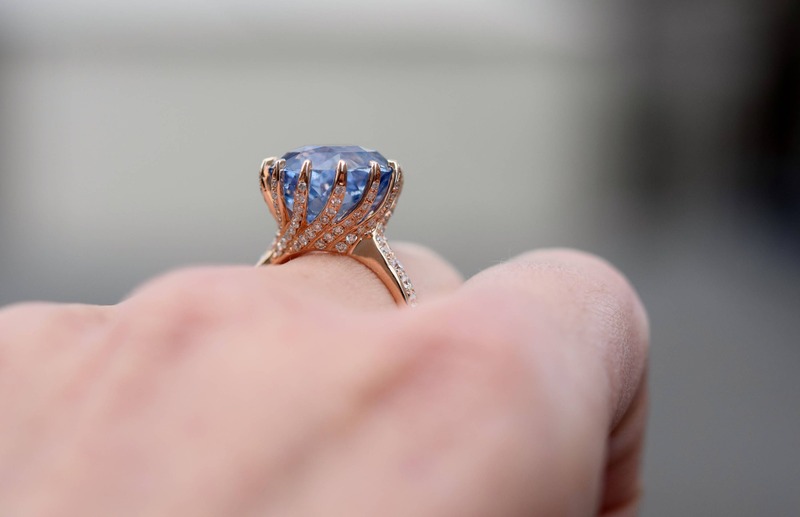 If you have any concerns regarding the ring, please discuss them with me before your jeweler does any changes. Please note, after 7 DAYS NO RETURNS ARE ACCEPTED (2-year repair/exchange in case of damage).